Joe Putignano performed in over 1000 shows with Cirque du Soleil's Totem as the "Crystal Man" and "Darwin's Monkey". He is the original cast member and helped create his role during the creation process at the Cirque du Soleil Headquarters in Montreal, Canada. Cirque du Soleil's Totem is directed by the world renowned director and actor Robert Lepage, who also directed the Cirque du Soleil show Ka. Cirque du Soleil did a documentary about Joe Putignano's past as a homeless drug addict, and reveals his process as he wrote his best selling book Acrobaddict. This documentary can be seen on Hulu TV http://www.hulu.com/watch/584945#i0,p0,d0 or click on the picture. Crystal Man symbolizes the evolutionary and spiritual change within all of us. The cast of Totem during the finale. Joe and Greg in the scientist number. Joe Putignano as "Darwin's Monkey" in the scientist act. Joe Putignano in the Carapace "High Bar" act. 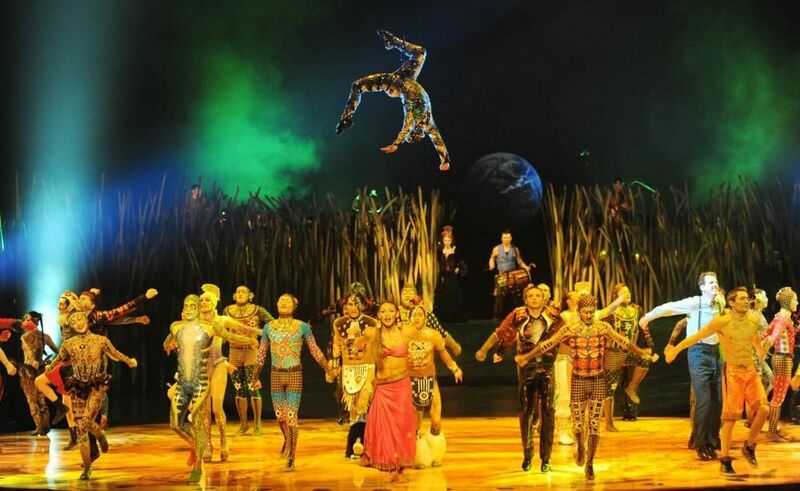 Greg Archer goes behind the scenes of Cirque du Soleil Totem. Talks with Crystal Man Joe Putignano about the show themes. Joe Putignano doing high bar during the Carapace number. Joe Putignano in the Washington Blade for a featured article about his past and how Cirque du Soleil's influence has helped him stay sober! Joe Putignano in a featured article about his past as an addict, and how Cirque du Soleil helped me stay sober. Joe Putignano on the cover for a featured article about his past as an addict, and how Cirque du Soleil helped him stay sober.